Home / Which factors influence the cost of septic tank installation? Which factors influence the cost of septic tank installation? Many homes and businesses in rural locations rely upon septic tanks for wastewater and sewage treatment due to the impracticalities of being connected to a mains sewer line. All water used in a property needs to be suitably treated – whether it comes from showers, toilets, washing machines, or other such sources – and a septic tank is a step in this process. Septic tanks can operate with very little maintenance required for many, many years. However, eventually they will need replacing as parts wear out or systems corrode. If your old septic tank is in need of replacement, or if you need to install one at a new property, you will likely be wondering what is the cost of a septic system? There is no easy answer, unfortunately, as many factors will influence the septic tank price and overall septic tank installation cost. To help you get an idea of what can contribute to the cost of a septic system, let’s consider some of the main influential factors. The size of the septic tank you choose will play a large part in the final cost. A professional can advise you on the best size for your needs – the more wastewater your home or business produces, the larger the tank you’ll require. Larger tanks will need pumping less frequently – giving you lower upkeep costs – but will have a higher upfront cost. What’s more, larger tanks tend to be installed underground which necessitates digging work and, therefore, additional labour costs. 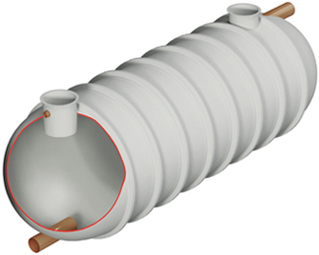 As mentioned in the previous point, the location of your tank – such as above or below ground – will contribute to the installation cost. Below ground tanks can be preferred as they keep the septic system largely out of sight which can be particularly desirable for domestic properties. Other factors related to preparing your site for the tank can also influence costs; for example, soil type, necessary depth of hole, obstructive plant life and site inclines. Septic tanks can be made from a few different materials, each with their own advantages and disadvantages, and price points. Concrete and plastic septic tanks are common options; older tanks may well be made from steel but due to their susceptibility to corrosion, these are less prevalent nowadays. Even with tanks of the same material, you can get a lot of variation in quality between models, so it’s worth consulting with an expert or two to hear their recommendations. If your septic tank is installed below ground, the system should be connected to a drainage field/soakaway which will allow wastewater to percolate through the soil to further treat it naturally. The installation of a drainage field will increase the initial cost of your system. However, this will allow your tank to be emptied less frequently, saving you upkeep costs during its lifetime. As with all things, quality costs. Experienced, trustworthy wastewater and sewage experts will likely charge more for their services. These higher costs are worthwhile in the long run though, as you can rest assured that you receive good advice and that your system has been installed correctly and safely, mitigating the need for expensive repairs in the near future. Wildon UK offer customers a wide variety of wastewater services and are experts in sewage treatment. As a well-established company with a skilled team of highly trained operatives, we can carry out installations, maintenance and repairs on a large selection of systems. To discuss your requirements with one of our helpful team, get in touch today – we serve customers in Stoke on Trent and throughout the UK.